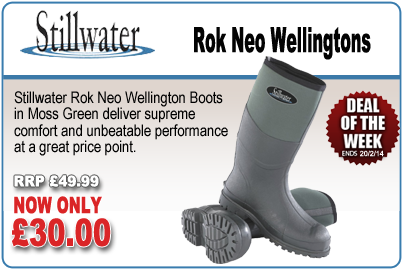 Deal of the Week, Stillwater Rok Neoprene Wellingtons, RRP £49.99, now only £30.00! These high quality boots sport 5mm thick, top grade Neoprene, ideal for all the wet weather we've been having lately. The lining is made from 3D Trival Vent which is a special hi-tech breathable fabric. Constructed with a complex network of channels which create a siphon effect, drawing moisture away from the feet, leaving you dry and comfortable.